Croquettes are one of those dishes that very rarely disappoint. A smooth, creamy interior and crispy coating make these fritters one of the most popular tapas dishes going. Also known as croquetas (Spanish version), these morsels are actually named after the French word "croquer" meaning to crunch. How cute is that? But what's the ultimate filling – cheese, potato, or meat? And how do you attempt them at home? More importantly, how do you ever stop at just one? 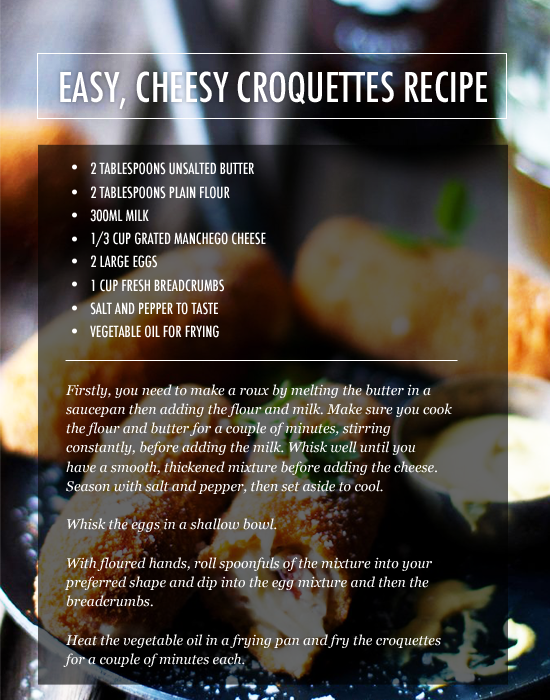 One of the best things about croquettes is their adaptability. You just need to choose a base for your mixture (mashed potato, thick roux or shredded meat) and flavour to your heart's content with cheese, herbs or spices. The Laneway is famous (within my circle anyway) for their braised Bangalow pork croquettes served with apple sauce. These, accompanied by a glass of vino and some shoestring fries, have become a post-work Friday tradition. Chester St Bakery and Bar serve up a classic British combo, braised leek and bacon, whereas Granada Tapas Bar go veggie with spinach and goats cheese. Once you have your mixture together, you just need to roll them up in the shape of your choice (classically a baton) and then dip in flour, then egg, then breadcrumbs. Regular crumbs will do, but panko will give extra texture or, if you're feeling really adventurous, you could try infusing flavour with crushed macadamia nuts. Lab Bar serves their moreish beef cheek croquettes with tomato chutney, broad bean, and braised witlof, making these a substantial start to any meal. Peasant stick with tradition when serving their tapas-style Grandma's recipe croquettes. These are absolute heaven to crunch into.